Trailhead is located on Lyndeboro Road in Lyndeborough, NH. From the junction of Rt. 47 and Rt. 136 in Francestown, travel south on the Second New Hampshire Turnpike. Drive 5.1 miles, then turn right onto Lyndeboro Road. There is a small parking area on the left in half a mile. It is marked by a sign for the natural area on the right. Lyndeboro Road may not be passable for some vehicles in the spring. Senter Falls is not really a single waterfall, but a series of cascades on a small brook. It is located in the Alan and Edgar Rice Natural Area, a tiny 16 acre preserve. 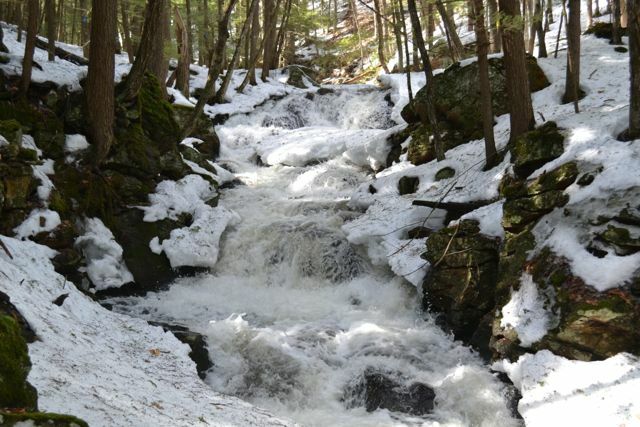 There is a loop trail through the preserve, which follows Cold Brook past the Senter Falls cascades. The trail begins across the street from the pull-off at a trail register. The trail descends through an open forest, following plastic yellow trail markings. Soon, the trail leads over the south branch of Cold Brook on a small wooden bridge. Here, the trail splits into a loop. Bear right to complete the loop in the recommended direction. As you walk through the forest, you will hear the rushing of the brook. Soon, you will meet up with the bubbling brook. As the trail starts uphill, the first set of cascades will come into view. They are two small, side-by-side waterfalls. You must descend from the trail in order to see them up close. Continuing up the trail, the path traverses across the steep slope, with planks in places as a guide, to the largest cascade in Senter Falls. You will see it under a ledge, flowing into a round pool. It is a dramatic plunge in early spring, but little more than a trickle in the dry season. It can be viewed from above, but the rock partially blocks the view. Just above, you will see a delightful water slide. From here, the trail turns away to ascend the side of Piscataquog Mountain. When it reaches a small plateau, it descends and returns to the beginning of the loop.